The perfect mix tape is an art form. When I've finished one, I feel as satisfied with that accomplishment as I feel with any art that I endeavor to create. Though I've forgotten it for many years, pushed it to the back of my consciousness while struggling to deal with the rest of life's realities, writing is like lifeblood for me. These posts, when they're done well. A poem. A song. And a mix tape, done right, gives me that same feeling of meaning, and accomplishment. 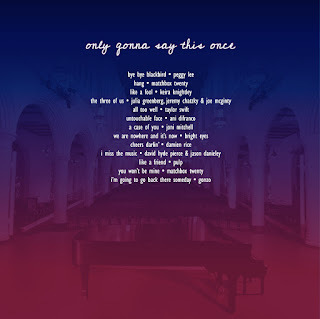 The one I'm listening to today, which I put together three or four weeks ago, is entitled "Only Gonna Say This Once." 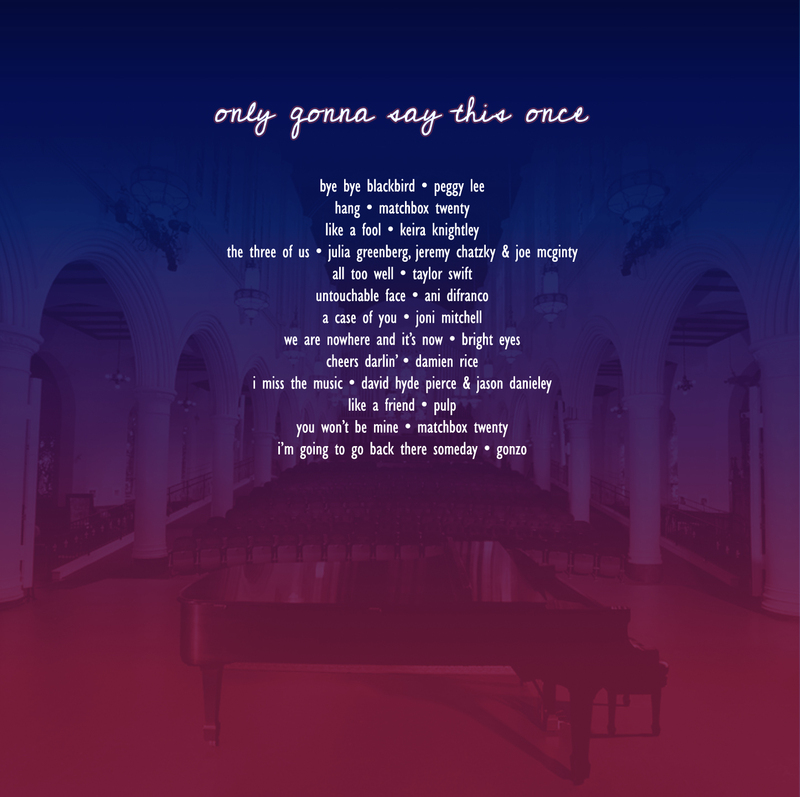 I designed cover art for it, but the whole thing never actually came to much of a physical reality. I never printed the art, or burned the mix to a CD, and I certainly never made it into a tape-- this isn't the early 90's. I use the term "Mix Tape" in the sense that Rob Sheffield, author of "Love is a Mix Tape", legitimized for me, as an homage to the first ones ever created, slowly and painstakingly pressing those mechanical buttons on one's cassette player. This mix, which is really just a playlist, for now, was composed for someone that you, dear reader, know nothing of, because the entire overlap of his life on mine has happened in the months-- nearly a year-- since the last time I wrote an entry here. Given that, it's not so much the reader who has never heard of him, since the reader, at this point, is probably overwhelmingly likely to be either Emily or Jeff, or no one at all. More accurately, it's the character in my mind who doesn't know about him, the sentient version of the blog itself. Somewhere in my mind, I have personified the recipient of each and every key stroke, the reader of every word, ever since this whole damn thing began. Is it some amalgamation of everyone who has ever roamed these hallowed hallways of my mind? Is it some long lost friend, a sympathetic character who has some kind of imagined form, totally independent of the readers? Or is it just some strange reflection of myself? Maybe all of the above. All I know is, I miss him. Her. It. I miss him, too. The person I made this mix for. I made it as a means of mourning what I thought was the end of our relationship, determined to hand the physical version-- yet to exist-- to him as we said our final goodbyes. Shortly after it was finished, he showed up to tell me everything was fine, all my fears were just imagined. The mix didn't need to be made. He showed up, one last time, to tell me that. And I felt like a fool for making the mix that I listen to now, alone in a room he'll likely never walk into, with him absent, once again, from my life. Just goes to show you, kids. Always trust your instincts. I knew at the time I strung the songs together that my reaction was premature. I know now it likely still is-- he may well be back. But, having lost him, temporarily, before, and seeing what the did to me the first time, I made the mix as a way to condense my mourning for the loss. I dove into missing him like an immersion course, hoping to come out on the other side quickly. Scars healed over, fluent in the language of heartbreak once again, and ready to move on. I'm sure this all probably sounds super dramatic and a little overbearing. Full disclosure: I have been drinking. Whatever it takes to write, I guess. Whatever it takes to be ready to talk about it. The mix, and the mourning, they did their job. When, after that brief moment of coming back into the light and making me feel stupid for having doubted him, he never reappeared, I didn't fall apart. I was frustrated, of course, and angry at the deception, but I couldn't really give into sadness again. Who was this person, playing such childish games, and why should I weep for him anew? I'd done it all before, and very recently, so I mostly got on with my life. He may well be back, even still. But that doesn't matter much. The next time he comes back, I will not be so starry-eyed, this time around, as to love him the way I did before. And I do love him. And I know that I will, when he comes back again, if he comes back again. So many things have changed about me, but that much remains the same, so far: when I love someone, I love them for good. In one way or another. But the way I love him will have changed. I will not be so naive, not be so eager and innocent and childlike. I will not, I think, love him in such a way that I'll ever need to make a mix for him ever again, in his many comings and goings in my life. And many, I suspect, there will be. The song now is "A Case of You" by Joni Mitchell...or it was, until just now, when it switched to a number by Bright Eyes. I was hoping to make some poetic parallel from the shots of Captain Morgan Cannonball I've recently ingested to the titular "case of you" that she sings of: "I could drink a case of you, and still be on my feet." But the moment has passed, as all moments do. And in that way, the mix is doing it's job, yet again: I'll never love him the way I did then, but I can go back to it, now, listening to this. I can feel what I felt. I have captured some trace my younger self's heart, through a series of songs sung by a chorus of unrelated artists. And I capture this trace of my heart today, for an older version of myself. Maybe that's who the mysterious "reader" is. So, whether he comes back or not, I will never have that moment again. This is all that is left of feelings I felt when I committed these songs to the memory of him, of us, of all that we were for such a brief, brief time. There was a lot to it, but, having aged and changed and matured-- no longer being someone who plays childish games or loves in starry-eyed ways, no longer someone who mourns every loss with a mix tape-- I haven't felt like I could talk about it here. Talk about who he is, and what we were, and what we could have been. There are consequences to that kind of honesty, and these would not have been mine alone. Beyond that, so much time has passed, dear imagined friend. How could you possibly understand it all with so little context? There's not a lot I'm at liberty to say about how I felt about him, how I felt spending time with him and what I tried to make him feel, in return. There's not a lot I'm at liberty to say about the time we spent together, and what we hoped to accomplish, and the connection that brewed between us that made him, so quickly, the type of person I wrote songs for, and, so quickly, someone that I wrote songs with. And, most importantly in the context of this post, the type of person I wanted to share songs with, such that they became a perfect mix. But if there's not a lot I'm at liberty to say, let me define him thusly: he was my partner. He was a creative who drew me out with his talent and believed in mine. He was someone I was determined to conquer the world with, me and him and our total brilliance. And, most importantly in the context of this post, he was the person who forced me to remember what writing and art really is to me. My lifeblood, whether it's a post like this, a song, a poem. Or a mix tape, done right.